US grain companies are refusing to accept a new variety of genetically modified soybean marketed by Monsanto because it hasn’t been approved by the European Union and may put exports at risk. Among the companies rejecting Monsanto’s latest biotech soybean are Archer Daniels Midland Co. and Bunge Ltd., two of the largest US grain traders. The product was launched in US and Canadian markets for the first time this year, but because the EU has yet to approve the soybean for sale, North American grain companies are uncertain and confused. If the regulatory approval issue is not resolved, the grain companies fear that it will cause price declines and will stop international trade to the EU, the world’s largest market next to China. In a letter sent to St. Louis-based Monsanto on April 29, grain groups railed the seed maker for selling its Roundup Ready 2 Xtend soybeans to farmers before getting EU approval. The groups, including the National Grain and Feed Association, the National Oilseed Producers Association and the North American Export Grain Association, said they had “grave concerns” about the export sector being at risk, and asked how Monsanto planned to ensure the Roundup Ready 2 Xtend seeds wouldn’t be mixed with approved seeds. The grain groups also criticized Monsanto for dramatically deviating from its previous prudent policy of getting the approval of an export market before selling the seed in that country. This isn’t the first time such an issue has arisen in the industry. In 2013 and 2014, China turned away unapproved shipments of US corn that contained a Syngenta AG trait called Viptera, which is engineered to control insects. That issue resulted in lawsuits that Cargill Inc. and Archer Daniels Midland Co. filed against Syngenta, claiming millions of dollars in lost sales and lower prices. Monsanto officials expected to receive approval before the spring planting season, but the final decision is expected to come soon, Miriam Paris, a Monsanto US soybean marketing manager, said in a recent blog post. Paris explained that Monsanto has waived some charges if growers decided to cancel the Roundup Ready 2 Xtend or exchange the seed for other varieties. Farmers are battling weeds that have become resistant to Monsanto’s signature Roundup spray. The new Monsanto seeds contain new genetic technology that allows soybean plants to withstand a new, more powerful herbicide. Monsanto projected that by 2019 two-thirds of all US soybean fields will be planted with seeds containing the new genes. Given the EU delay, Monsanto’s vice president and chief commercial officer, Mike Frank, said the company has scaled back its initial projections of three million US acres for the new product. It now estimates that the new soybeans will be planted on two million acres this year. Gary Anderson, senior vice president of CHS, a North American grain marketing business, said his company prefers that all approvals are set before the seeds are available for farmers to plant. “We’re not making any statement to whether it’s an actual safe product or the science of this at all,” Anderson told the Star Tribune in Minneapolis. CHS, based in Minnesota, is the nation’s largest farmer-owned cooperative. Several major grain elevators, soybean processors and other first purchasers have also issued notices that they will not accept the new soybean varieties. 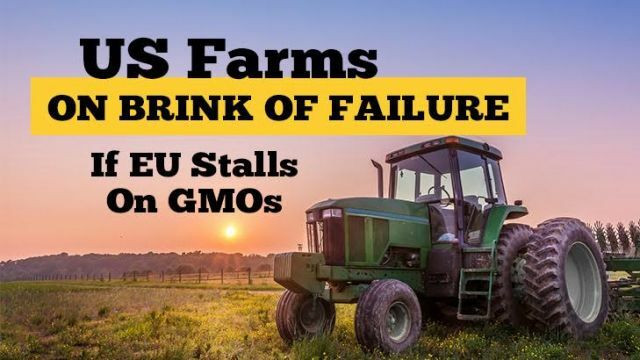 Hey Buddy!, I found this information for you: "US Farms On Brink Of Failure If EU Stalls On GMOs". Here is the website link: https://www.thealternativedaily.com/us-farms-on-brink-of-failure/. Thank you.